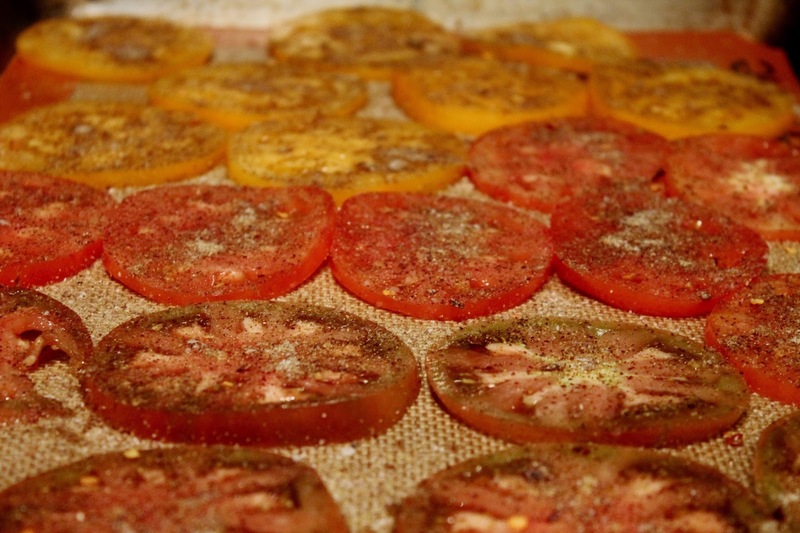 I love cooking with tomatoes during the summer, since they are so delicious, abundant and varied. I love making a quick pasta sauce with chopped tomatoes in a pan with other vegetables, herbs and spices. I love roasting tomatoes with olive oil, salt and pepper until they are shriveled and their savory notes are more pronounced. But summer tomatoes are wonderful raw too. When the fahrenheit gets to be too extreme to turn the oven or stove on, a great no-bake recipe like this one I found in a recent issue of Bon Appétit really hits the spot. This is almost like a pizza, which is perhaps what drew me to it. The dish starts with flatbread. 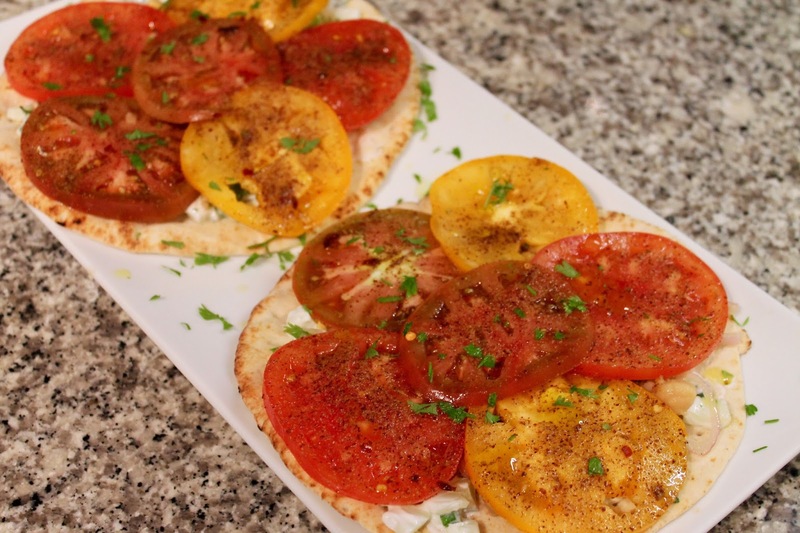 Although the original recipe--from Joshua McFadden of the celebrated Portland restaurant Ave Gene's--includes a recipe for making the flatbread, it's quicker and won't warm the kitchen if you use something pre-made. I started with a plain Mediterranean flatbread from the grocery store similar to a pita but without the inside "pocket." From there, the flatbread is topped first with a cooling yogurt-cucumber sauce, then partially mashed and seasoned chickpeas, and finally a layer of sliced and spiced tomatoes. The recipe below was enough for four flatbreads. I figured we'd eat two and have two leftover; I was wrong. They didn't stick around long. I made a few modifications from the original recipe. Instead of fresh garlic, I used garlic powder in the mixture for spicing the tomatoes. The mixture is sprinkled over the tomatoes, and chopped garlic--being slightly wet--doesn't "sprinkle" as well as the powdered form. I also used Greek instead of plain yogurt, since that's what I had on hand. I could see this recipe taking well to a number of variations: whatever fresh herbs you think would be tasty, substituting cannelloni beans for the chickpeas, using more or less chili pepper flakes (or substituting aleppo pepper), depending on your taste for spice. 1. Combine garlic powder, sumac, chili pepper flakes, coriander, cumin and salt in a small bowl. Line a rimmed baking sheet with parchment or Silpat. Spread the tomatoes on the baking sheet in a single layer. Sprinkle with the spice mixture and set aside for 30 to 60 minutes while you prepare the rest of the recipe. 2. Combine the chickpeas and vinegar in a medium-size bowl and season with salt and pepper, to taste. 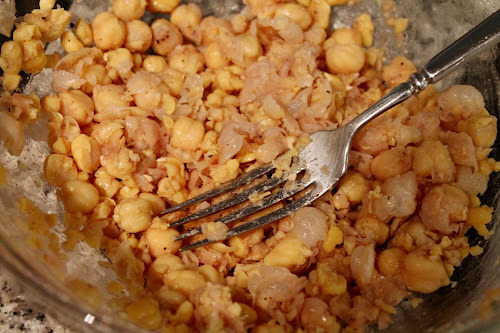 Mash with a fork until about half of the chickpeas are smashed. Stir in the sliced shallot, parsley and olive oil and set aside. 3. 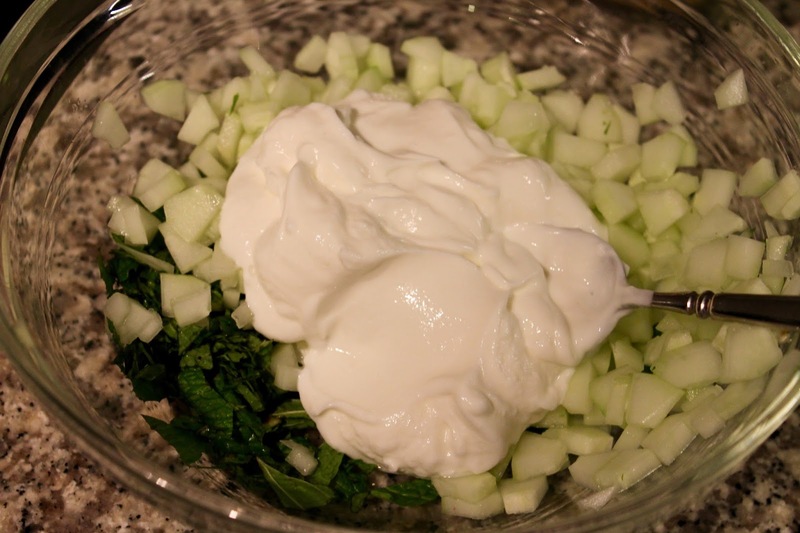 Combine the cucumber, yogurt and mint in a medium-size bowl and season with hot sauce (if desired), salt and pepper. 4. 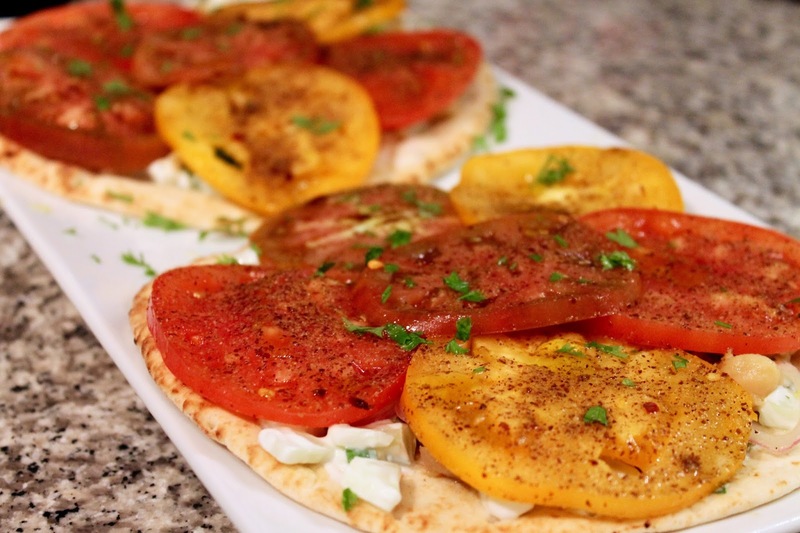 Assemble the flatbreads: place a flatbread on a plate. Spread about 1/4 of the yogurt sauce on the bread, then top with about 1/4 of the semi-mashed chickpeas and layer on about 1/4 of the sliced tomatoes. Top with a drizzle of olive oil and more salt and pepper, as desired. Serve room temperature either whole or sliced into wedges sprinkled with some additional parsley. Gathering Green Featured on Cilantro Cooks!